It's hard to quantify how Japan changed my relationship to food, but like any great culinary experience, it most certainly did. I experienced tastes I had never even imagined before. I ate foods I had never heard of, and I ate foods I had heard of many times but had never tasted in their most perfect form. No food was more surprisingly exquisite than the sushi. Sushi was the first meal I ate in Japan. We were up early due to jet lag (16 hour time difference), and soon after 5 AM we set off for Tokyo's famous Tsukiji fish market. Among other things, Tsukiji is the place where tuna auctions take place, and every imaginable type of fish is sold. Certainly, tourists visit this place in droves. However, just like Pike Place in Seattle, this is a real functioning market. Just outside the market are countless restaurants and food stalls. They're all up and running, bustling and steaming, before the sun has even considered rising. After walking around for a bit, we spotted a place full of locals and were lucky enough to walk in just before a long line formed behind us. The place seated no more than a dozen folks at a sushi counter manned by three chefs. These guys weren't messing around. With the first bite of fatty tuna (toro), I realized (despite having lived in Hawaii, despite eating sushi all over the West Coast), I had never had fish this fresh, and therefor had never tasted fish as good as I did in that moment. The taste of uni was completely redefined at that sushi counter. Uni had never been as buttery, unctuous, or perfect. I instantly fell in love with Japan over breakfast, and the love affair didn't end for the duration of the trip. For our last dinner in Tokyo, we went to Sushi Yuu. The recommendation for the restaurant came from a friend living in Tokyo with great taste in food. I knew it would be good, but I had no idea just HOW good it would be. The restaurant is inviting and warm, and Chef Shimazaki-San makes you feel welcome and taken care of from the moment you arrive. As an interesting side note, the Chef is married to a Russian woman. His English is quite good, but we were able to speak in Russian as well. I never expected I would be speaking Russian to a Japanese sushi chef, and it was a great joy to do so. There's no menu, there's no ordering, you sit down and go along for the ride of incredible food. 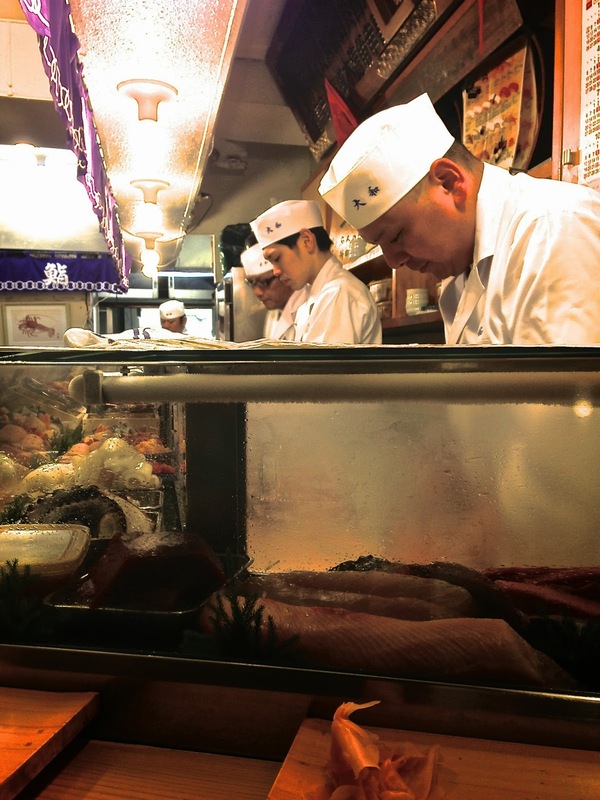 You will be served the highest quality fish, rice, wine, miso, freshly grated wasabi, etc. etc. etc. The sushi is a work of art in its own right, but I was equally blown away by the Chef's pickled baby ginger. I love anything pickled and anything ginger, and I had no idea that pickled ginger could taste as good and delicate as the chef made it taste. The ginger is pickled the same day it is served, and because it is baby ginger, it is tender, soft, not too sweet, and perfectly balanced in flavor and spice. I could eat buckets of the stuff. I would go back to this restaurant just for the ginger, and that's saying a lot, because the Chef served us the best sushi of my life. Sushi for our first breakfast and our last dinner were the perfect bookends to an incredible trip. If you find yourself in Tokyo, let me know. I will send you straight to Sushi Yuu.